Starform Transparent Glitter Stickers gold: 1004, 7017. Starform Text Stickers gold: 342. Paper: light green, dark green, orange, brown, yellow, red. Place 1 daffodil on orange paper, 1 daffodil on yellow paper, 1 sunflower on yellow paper, 1 sunflower on brown paper, 1 daisy on orange paper and 1 daisy on red paper and cut all flowers out. Place 3 flowers on the card and cut the leaves from the other 3 flowers and place the hearts with foam pads on the flowers. Place borders and leaves on dark green paper and cut them out and place them on the card. Place a strip green paper (1x14,8 cm) on the card and place texts on it. 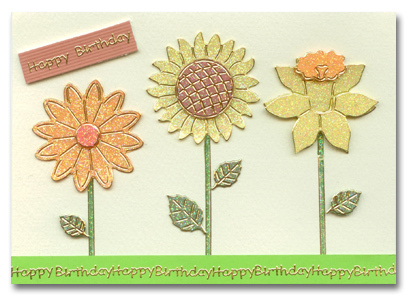 Place a piece of brown paper (4,5x1 cm) on the card with foampads an place a ‘Happy Birthday’ text sticker on it.